Sara Pennypacker is the award-winning author of illustrated children’s books that are funny, touching, and real. The themes running through her stories are the enduring ones: friendship, family, loss, joy, and independence. In a booming and competitive market for children’s literature, Pennypacker has earned an international following of diehard fans. Her genius lies in creating characters you instinctively root for, love, and remember long after the book ends. 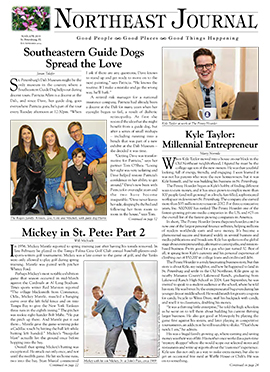 Pennypacker splits her time between Cape Cod and St. Petersburg, where she and her partner, David, are busy remodeling their home in the Old Northeast. “I love it here,” she said during our backyard interview on an overcast winter’s morning. “I swim most days in the pool or the Gulf, and I’m besotted by palms and orchids.” With the occasional interruption from the construction crew, she spoke with animation and wry humor about why she has dedicated her life to writing for children. Congratulations on the release of Totally Clementine, the seventh and final book in a series about a spunky third grader named Clementine. How are you dealing with closing the chapter on her adventures? A New York Times reviewer called you a “girl whisperer.” What do you make of that? I was incredibly honored. It meant that I was telling the truth… about a young girl who’s high-spirited, kind, and creative. When I did research on creativity, I found a fascinating study that showed where creative people fall on the “normal” spectrum. Basically, they live at the extremes – they can be both naïve and sophisticated, playful and serious. Creative males are more nurturing; creative women are more assertive. Clementine is definitely a true creative in gender behavior: Her best friend, Margaret, freaks her out because of her girlishness, while Clementine’s brother is a mystery when he pounds rocks for hours. What did Marla Frazee’s illustrations bring to the Clementine series? I often say that I never needed to write a word about the love in Clementine’s family because Marla’s drawings show it so well. Marla and I had the same vision for the Clementine series: a bit retro, character-driven, funny but loving. And we’re both perfectionists. It’s an ideal pairing. How do you summon up your best ideas? The creative state is a benign form of mental illness – all those alternative realities and multiple personalities. Sometimes, when I don’t know what to do with a character, I think of him or her when I’m falling asleep or swimming. (When I swim, I’m always writing.) Good ideas come out of the subconscious. You were a painter before you became a writer. Why did you make the shift? Painting wasn’t my native language… I had to really think about it. I love the dream state I’m in when I write. I lose all track of time. Do you ever find people are more interested in hearing about your life as a writer than your books? Yeah, it’s funny. People think I slide out of 5,000-count sheets around noon, light up a clove cigarette and start pouring out words like pearls on a necklace. I take a break around 3pm when Andy Garcia calls me about a movie script. Truth is, I live a normal boring life, except I write all the time. I live with all my characters in my head and heart. I love them very, very much. If they were real, I’d take a bullet for them. What do you say to people who wonder why you write for kids (rather than adults)? Harrumph… you might as well ask me why I breathe air. I write for kids because I need to do it, because it challenges and fulfills me, and because I’m pretty good at it. It’s what I’m meant to do. I have two absolutely fabulous children who are grown now. When they were kids, they were nut balls. My kids were the inspiration for Clementine, especially my son who suffered attention issues in school. He was the kindest, most empathetic student in the class…like Clementine. I don’t want to give too much away, but I’m finishing up a book called Pax, a large novel in scope and very difficult to write. It says all the things I want to say about how war affects children. The story is about a boy, his pet fox, and the journeys they take to reunite after war separates them. The book concept sold right away in eight languages, which I didn’t expect. What advice do you have for people who want to write? Read, read, read. When you find a book you really love, read it again and try to figure out how the author gripped you. Writing is all about discipline, not some hobby you pick up on the weekends. If you could go back in time and give advice to yourself as a neophyte writer, what might you say? Oh, probably worry less about my wings, and fly more. 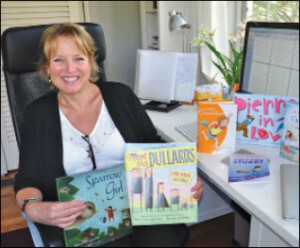 Sara Pennypacker is the author of 18 children’s books, including The New York Times best-selling Clementine series; Summer of the Gypsy Moths; Pierre in Love; Sparrow Girl; and The Amazing World of Stuart. She also contributed four books to the venerable Flat Stanley series. Her books have won top awards, including a Golden Kite Award, a Christopher’s Medal, and many children’s choice state awards. She frequently speaks about writing children’s books at elementary schools, conferences, and college programs. She also loves bird watching, raising orchids and… pie.